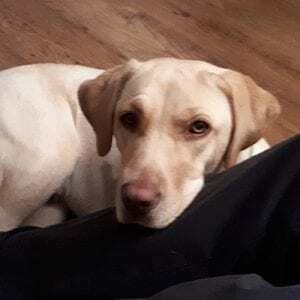 Young Labrador Tess had cardiac arrhythmia – her heart had been beating too fast for prolonged periods of time causing her heart to fail. When this happens the heart muscle becomes progressively weaker and eventually fails. Without an effective treatment, Tess was at risk of severe heart failure at any time and could die. Tess needed urgent surgery. The dog’s owners were devastated and ran an online appeal to raise the money to pay for it. Davies agreed to perform Tess’s surgery at a very reduced cost to make sure that Tess was treated as quickly as possible. Complex and expensive drugs used to be the only option to treat dogs with cardiac arrhythmia but now some sick pets are given radiocatheter ablation, a procedure regularly used in human medicine but is almost entirely out of reach for pets. 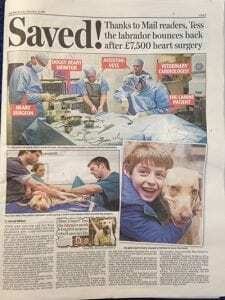 Davies’ pioneering veterinary cardiologist Pedro Oliveira teamed up with Martin Lowe, a doctor from St Bartholomew’s Hospital in London, to perform the procedure. Pedro is currently the only veterinary cardiologist in the UK performing the cutting edge procedure and Davies is one of only a handful of centres in the world that routinely perform the technique. The procedure involved catheters being inserted into veins in her legs and neck and guided into the heart. Electrical signals showed the presence of two abnormal electrical pathways in Tess’s heart as the origin of the arrhythmia. Radiocatheter ablation was used to treat this by applying localised intense heat to destroy the abnormal pathways. Tess’s operation went smoothly and she was able to go home to her family the following day. 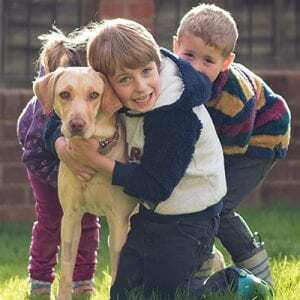 The problem has been completely cured and she’s now leading the normal energetic life of a lively two-year-old Labrador. Davies has successfully treated 17 patients with radiocatheter ablation in the past two years. Pedro is convinced there are many undiagnosed cases out there, because of a lack of awareness of the condition and the fact that the diagnosis is challenging, requiring the expertise of veterinary cardiology specialists. Early signs of cardiac arrhythmia may be very difficult to identify. These may include a reduction in the ability to exercise, lethargy, reduced appetite, weight loss, gastrointestinal disturbances, frequent panting, weakness or fainting. In more advanced cases heart failure (fluid in the lungs, chest or abdomen) and even death may occur. Occasionally a fast heart may be documented during a routine consultation but often a Holter monitoring is required for a diagnosis.